Caution use in children less than 35 kg and in patients with liver or kidney problems and lactose intolerance. Consult the doctor before using this product if pregnant, lactating, or taking other medications such as antacids. Dry mouth, dizziness, anxiety, flushing, diarrhea, painful or tender breasts, absence or suppression of menstruation (amenorrhea), milk discharge from breasts (galactorrhea). 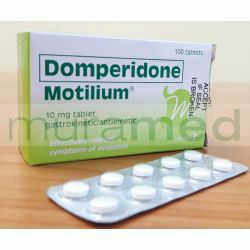 This product should not be given to patients with known allergy or intolerance to domperidone or to any of its components, those with gastrointestinal bleeding, obstruction or perforation, and prolactinoma.